Mycobacterium bovis BCG has been widely used as the antituberculosis vaccine and is also a well-known immunopotentiator in both humoral and cell-mediated immune responses. 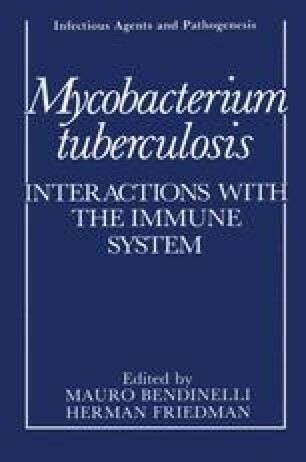 Bacillus Calmette-Guérin (BCG) or Mycobacterium tuberculosis is an indispensable component of Freund’s complete adjuvant and has been used in various experimental systems to potentiate immune responses. Because of its adjuvant activity, BCG has been used for immunotherapy of cancer, such as acute lymphoid leukemias1 or melanomas2 in humans. There are quite a few reports in this field both in animal experiments and in human cases,3–7 many of which indicated improvement or even cure of the tumor by the immunotherapy with BCG. However, several reports show enhanced tumor growth by treatment with BCG. Likhite4 reported that in some instances tumor growth was enhanced by BCG injection in rats. Piessens et al.8 showed that injection of a tumor cell-BCG mixture into rats resulted in either suppressed or enhanced growth of the tumor depending on the dose of BCG. Mathe,9 who had emphasized the immunotherapeutic effect of BCG, even found that a high dose of BCG suppresses antibody production against sheep red blood cells (SRBC) in mice. BCG injected intravenously (IV) induced suppressed immunity to rodent malaria.10 Thus, it has been known for some time that the famous immunopotentiator BCG has double-faced activity, modulating immune responses either into a positive (immunity) or negative (suppression) direction.